Began as an invert colors meme from awhile back but it also involved inverting his personality too and I couldn't think of how to invert his personality too, since that would make him dumb as a stump and he probably wouldn't be wearing something like that. I still liked the way the color scheme worked so I just pallet swapped my avatar for the hell of it! 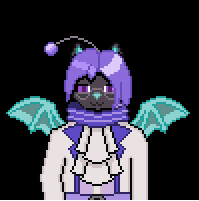 I am taking requests and/or commissions for pixel work like this on the off chance anyone cares; note that RL guff means I haven't had much chance to work on either recently but I'm willing to do both.